I am a candle nut. I love them so much that I’ve got one in just about every room of our house. There’s just something nice about that soft, glowing light that makes a room feel so home-y and cozy. But when you burn candles as often as I do, the cost really adds up quickly. And then there’s the collection of pretty glass candle containers that I couldn’t bear to get rid of, and wished that I could use again. So I decided to learn how to make my own candles at home so that I can save a bit of money and reuse some of my favorite candle containers. Candle making is really very easy, especially since now we can get candle supplies in most craft stores and online. Please note, this post contains referral links, which means that I earn a small commission at no extra cost to you when you make a purchase through the link. I also love the fact that you don’t need any special equipment to make a simple candle…just a container, a wick and the wax. The container can be made of glass, metal or ceramic materials…basically, anything that can withstand hot wax being poured inside and provide a sturdy base for the wax. Since I am such a fan of candles, I’ve collected quite a few glass jars and containers over the past few months. You’ll also need the wax to make the candles and some wicks, which are wax-coated strings attached to a metal tab. You can make your own candle wicks, but I find that it’s much easier to purchase them when you buy the wax. Lastly, you’ll need a heat-safe container for melting the wax. I use my 4-cup liquid measuring cup to melt my candle wax in the microwave, but you could also use a small sauce pan on the stove. You’ll just want to make sure to wash this container throughly when you are finished to ensure that no wax stays behind that might get into your food. How do you get candle wax out of a glass container? 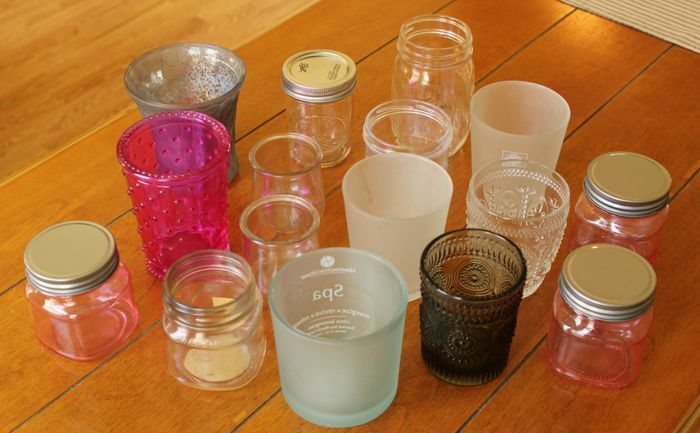 If you want to reuse glass containers to make candles, you’ll probably want to make sure that any residual wax from the last candle is completely gone. The easiest way I find to get old candle wax out of a glass container is to pop it into the freezer for a few hours until the wax is frozen. It will usually pop right out in one whole piece as you slide a knife under the wax on the side of the jar. You can also try heating the container until the leftover wax is melted and then pour it out into the trash. When the leftover wax is gone, wash the glass container in the dishwasher to get rid of any last little bit of wax. 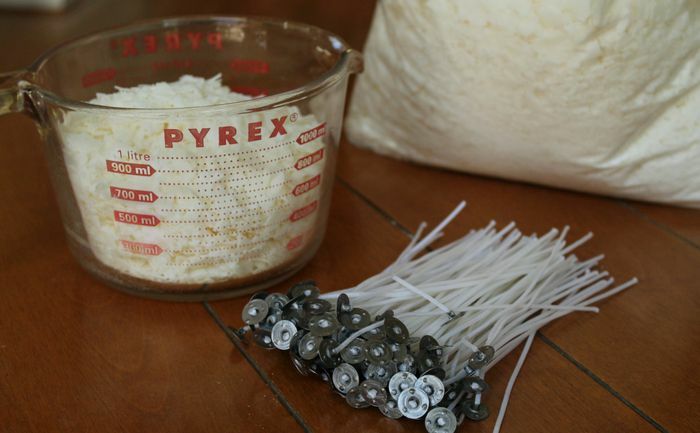 To get started making your own candles, you’ll want to melt the wax. I put mine in the microwave at 1 minute intervals, stirring with a popsicle stick after each minute, until the wax was completely melted. Take your wick and dip it into the melted wax, then immediately stick it to the bottom of the container that you are using for your candle. At this point, you’ll want to use a pencil or other similar-sized object to steady the wick in the center of the container. Just carefully wrap the wick around the pencil, until the pencil rests on the top of the container. Don’t worry about how it looks right now…you’ll trim the wick when the candle is poured and set. Next, pour the melted wax into the container, leaving about a half inch of space at the top. Leave the candle to set up for a couple of hours, then trim the wick down with scissors. With one order of wax, I was able to make 21 candles…in big mason jars, in small tea cups, and all sizes in between. And I still have a bunch of wicks left when it’s time to make more candles. Not only do I love the price of these homemade candles, but I love that you can customize them to your preference. I left mine colorless and without scent, but if you like a certain scent, it’s easy to add it to the melted wax. 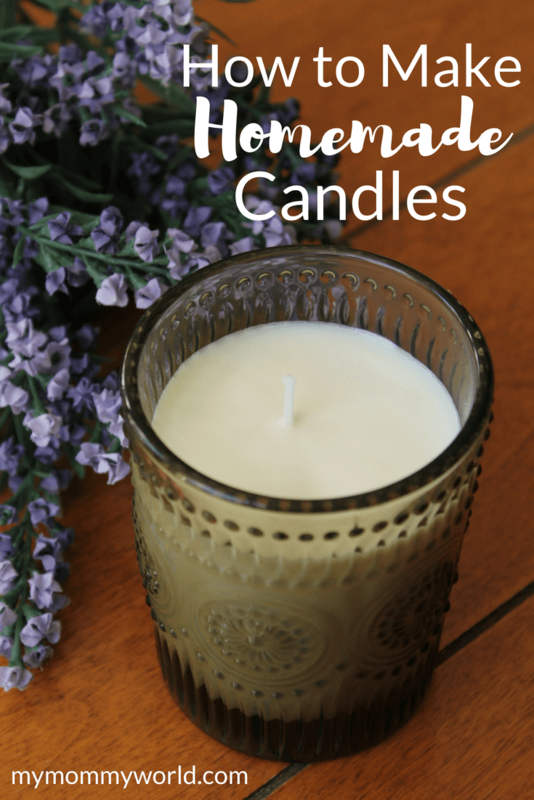 These DIY candles are not only great to burn in your home, but they make great gifts too…especially for Mother’s Day and for teachers…or anyone else that appreciates a homemade gift. This is a great project. I love that you used a teacup for the container too. It looks so cute.